"Once upon a time, an angel and a devil fell in love and dared to imagine a world free of bloodshed and war. But can any hope be salvaged from the ashes of their broken dream?" You know… I didn’t really need another obsession… but with this series I got one. I don’t think I’ll ever be able to adequately express my undying love for these books. This book was agony to read but at the same time it was amazing. Like I said, this book was agony to read. Both Akiva and Karou are so alone and everything seems so hopeless. With the way things left off it’s hard to believe they will ever make it work but my gosh I want it to work so badly. I love those two so damn much and they are breaking my heart. And not even just in terms of their relationship but just everything. They both have so much going on and with every step they take they get shoved back three steps. This book continually takes me by surprise. It’s been a long time since I’ve been so caught off guard by a book and I absolutely love it. This book delivers such a great world and wonderful side characters. I so adore Zuzana and Mik. Those two are something special. And not only characters I love but characters I hate. Ohhhh there are a few characters I wanted to throw into the pit of despair. And that brings me to my next point. See these characters come from both sides of this war. I love that this isn’t good vs evil and is so much more complex. Both sides of this war have horrible people and both sides have stooped to horrible lows. Its gut wrenching and I love the complexity of it. It’s too simple to be just good vs evil with one clear good guy. This dynamic makes the story so much richer. Laini Taylor created a stunning world here and her writing is absolutely gorgeous. The way she weaves this all together is amazing and the way she tells the story is beautiful. I love the differing perspectives and I never know who I want to spend more time with. I just love it all. 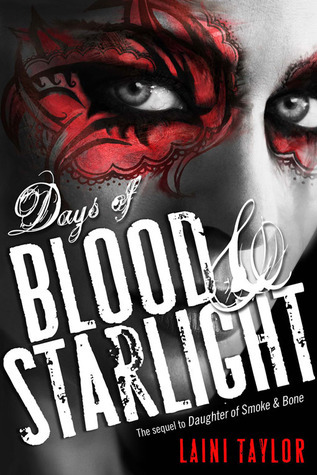 Days Of Blood And Starlight is a book that destroyed me but I also loved it more than I can say. This series is simply amazing. I feel like I read this some years ago but for the life of me, I cannot remember a single thing about it. I definitely never read the final book. I need to reread the series! I remember feeling so sad about everything, but also very hooked on the story. A confliction of feelings! I'm glad you loved this book, Teresa! I hope you enjoy book three! I love Laini Taylor! I'm glad you loved this one. After finishing the third, it became one of my favorite series ever. Great review! I love when you read a book I want you to read, but I ESPECIALLY love it when you love it as much as I do! You read this one right! lol I wholeheartedly agree with everything you say here. Lovely review. Can't wait to buddy-read her latest book!